The Geeky Rabbit: fun nail art designs with Etude House Color Pop! I had featured the Etude House Color Pop nail polishes previously in this post. Today, I shall share some DIY nail art ideas using the nail colors from the collection! I love how vibrant, pigmented and bright the polishes are. I came up with 4 different designs. Instructions and tips after the jump! The first step is to prep the nails with base coat, and 2 layers of base color. I have 4 different nail looks, so there are 4 different base colors. On the leftmost nail, I used CGR705 from the Color Pop Collection. 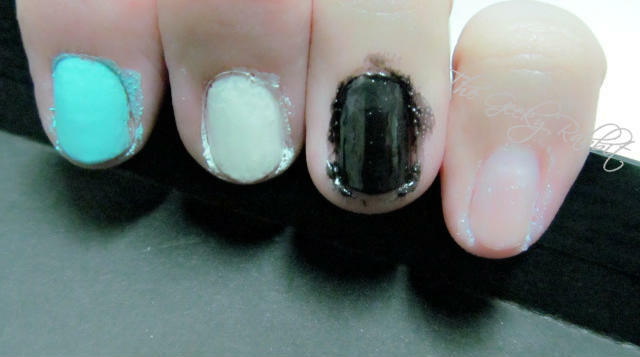 The next two nails are painted with Mini French in White and Black (applied over the entire nail, to form a complete base color). For the last nail, I applied base coat and did not add any color. You can use a beige or pink base color if you wish. 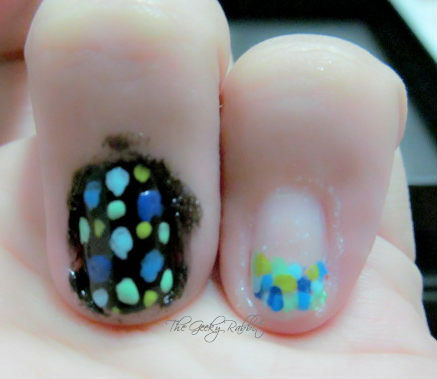 The first design is a polka dot nail art. 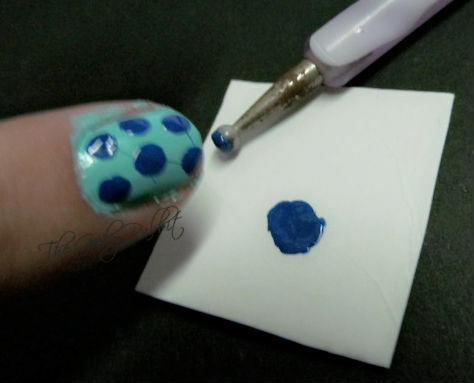 First, use a large dotting tool and apply large blue dots over the minty blue base. I used CBL605, a dark blue color for the large dots. 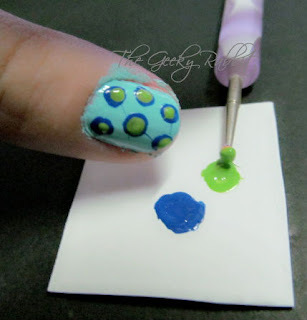 After the large dots are dry, add smaller dots of a contrasting color in the middle of the blue dots. I used CGR701 (a bright green) for this step. This completes the polka dot look! It is different from the usual single-color polka dot. For this design, any combination of 3 bright colors would be great. A very fun and funky look! For the second look, I painted stripes of different colors across all the nails. I did this design on the index finger. 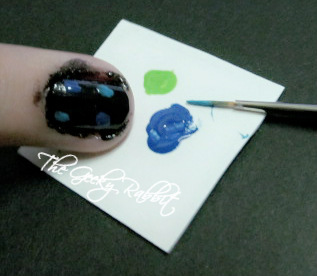 Based on the width of my nails, I managed to use 5 different colors for this nail art. I like how the blues and greens contrast with the white base! In this design, I used (from left to right, as shown below): CBL605 (dark blue), CBL603 (light blue), CGR705 (aquamarine), CGR703 (bright green) and CGR701 (deep green). I used a thin paint brush to draw the lines. Similar brushes can be obtained at any craft supply store. 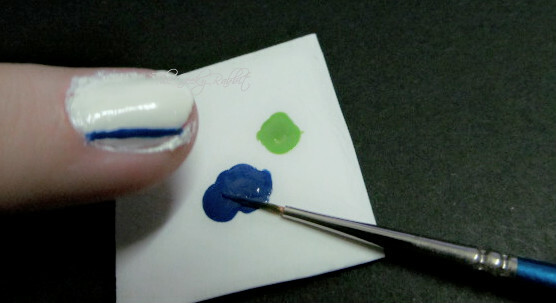 Do remember to clean the brushes between painting different colors so that the colors will not mix or streak. In the forth design, I decided to use a black base color. One awesome thing about the Color Pop nail polishes is that the colors are so vibrant and pigmented that they show up even on a black base! Awesome! 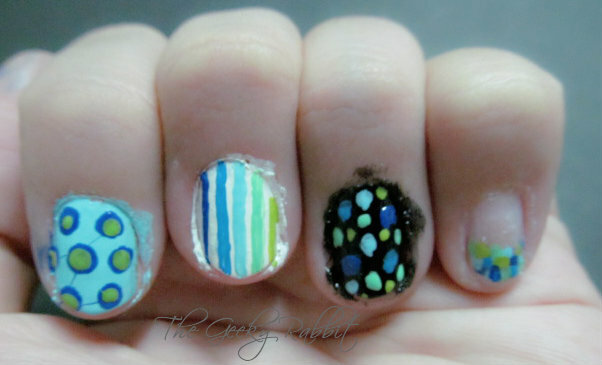 I painted random dots all over the nail, with different sizes and different colors. 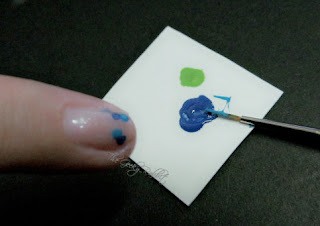 This step can be done using either a thin brush, or with a dotting tool. As with the previous design, I used 5 different shades: CBL605, CBL603, CGR705, CGR703 and CGR701. The last look is done on a plain nail. 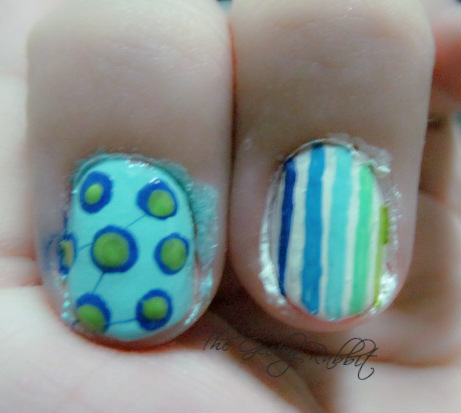 I painted small dots on the nail, close to the edges with different shades of blue and green. The colors are splattered randomly. This creates a colorful twist to the usual french nail. The blue and green tones used are CBL605, CBL603, CGR705, CGR703 and CGR701. 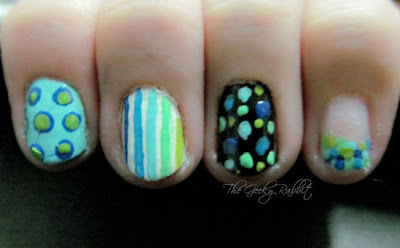 The overview of the 4 nail art as above. I love how versatile the colors in the Etude House Color Pop nail art are. They are great for creating nail art with all sorts of base colors, and are extremely pigmented! I love how the designs turned out. Very cheerful and adds a 'pop' to my nails! The color scheme also reminds me of water and the beaches, a very summery theme.